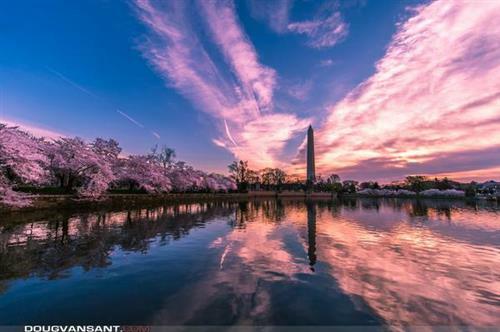 Washington, D.C., cherry blossom news and photos from the 2015 season. 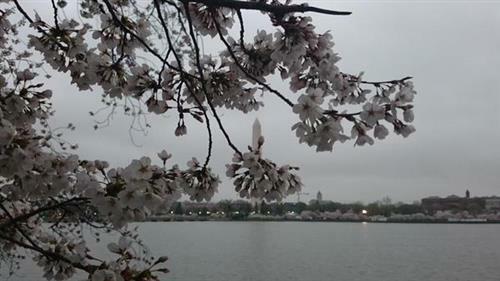 Washington’s famous cherry blossoms are set to hit peak bloom this weekend as the National Cherry Blossom Festival draws big crowds for its annual parade and Japanese street festival. 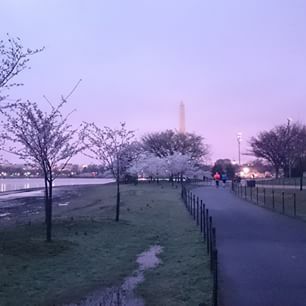 WASHINGTON — The cherry blossoms are revealing their beauty, and after a long, cold winter, they are a welcome sight. 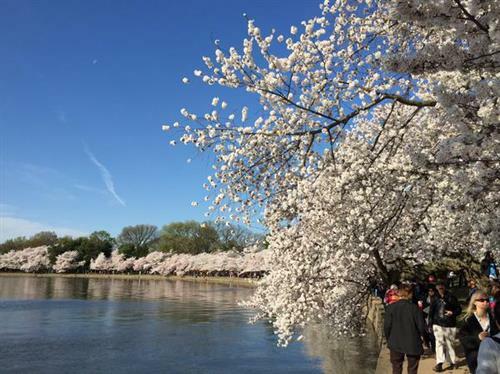 The cherry blossoms are expected to be in peak bloom through Tuesday — just in time for the final weekend of the 2015 Cherry Blossom Festival. Read some tips to have fun and avoid major crowds on WTOP.com. 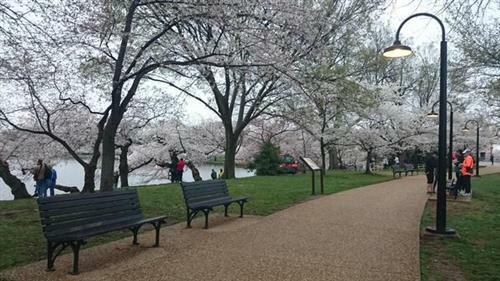 Cherry blossoms around D.C. are beginning to bloom. 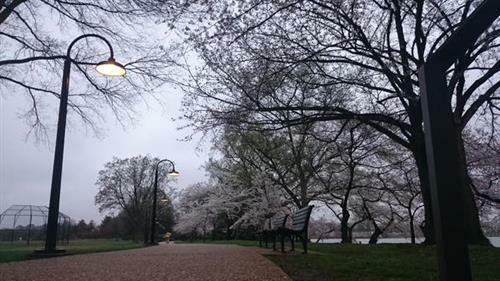 Take a look at some photos in our gallery, and share your own on Twitter using the hashtag #WTOP. 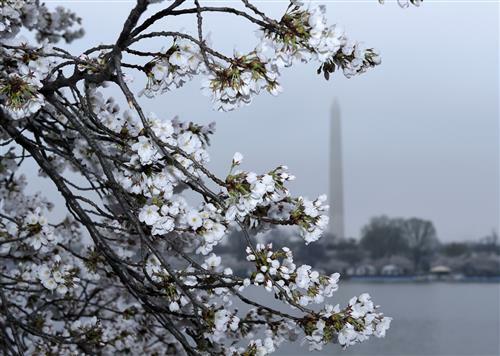 WASHINGTON — The National Park Service predicts the cherry blossoms’ peak bloom dates to be April 11- 14 this year. 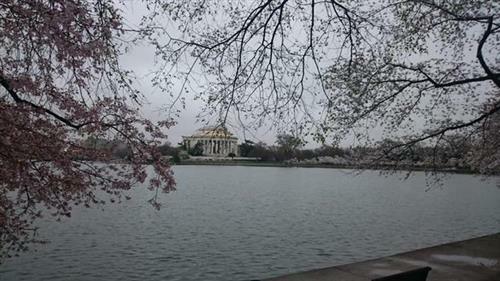 The peak bloom typically occurs around April 4, but the park service said earlier this week that it could happen later this year because of the weather’s impact on the trees. 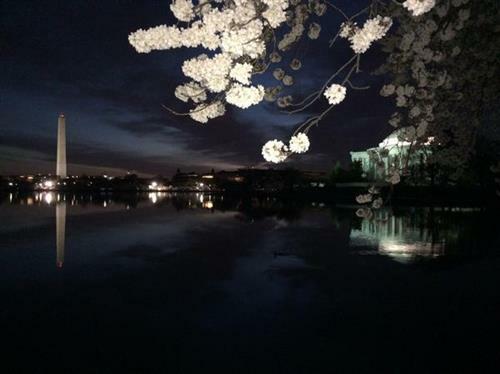 It's hard to take a bad photo of the beautiful cherry blossoms, but it's difficult to take phone photos that stand out. Photographer Cedric Terrell explains how. 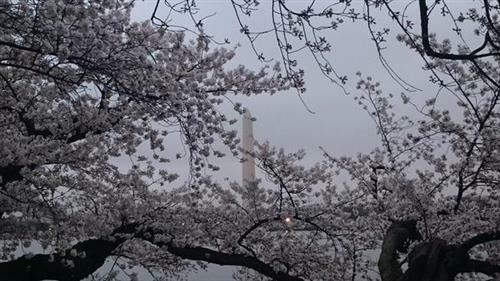 It’s the million dollar question Dennis Potts is accustomed to getting every year, sometimes from folks as far as Japan: When will those Kenwood Cherry Blossoms reach peak bloom? 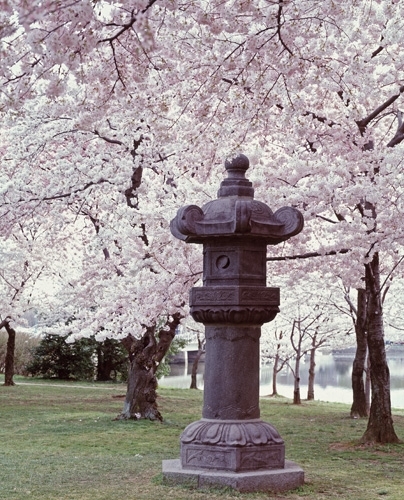 As a general rule, the Kenwood trees reach peak bloom about three to four days after the Tidal Basin cherry trees, which are exposed to more sunlight. 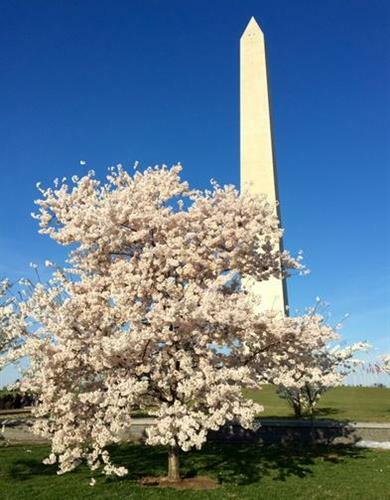 With the National Park Service estimating an April 8-April 11 range for peak bloom downtown, you can expect the roughly 1,200 Kenwood cherry trees to hit the peak bloom period anywhere from April 12-20, Potts said. 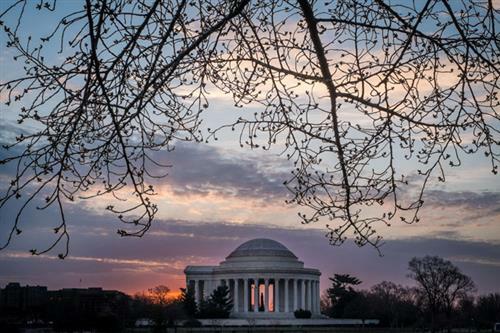 WASHINGTON — It’s unseasonably cold and areas to the north and west of D.C.could get snow Friday — the first day of spring. 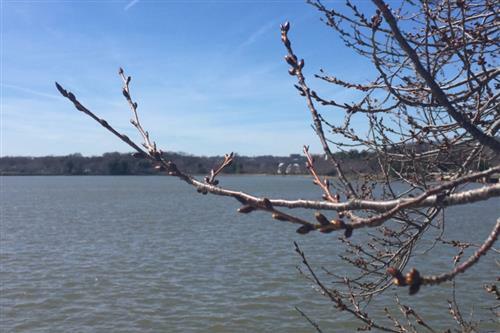 But the cold snap isn’t changing the predicted peak bloom date for Tidal Basin cherry blossoms. 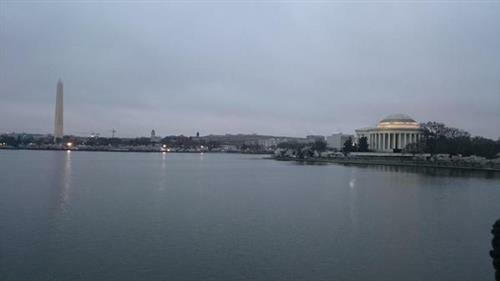 “We expected the colder weather,” says Michael Stachowicz of the National Park Service — National Mall and Memorial Parks. 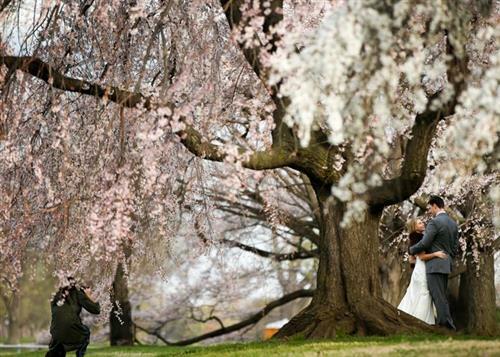 He’s sticking to his prediction announced in early March for a peak bloom date to be April 11-14 for the 2015 season. 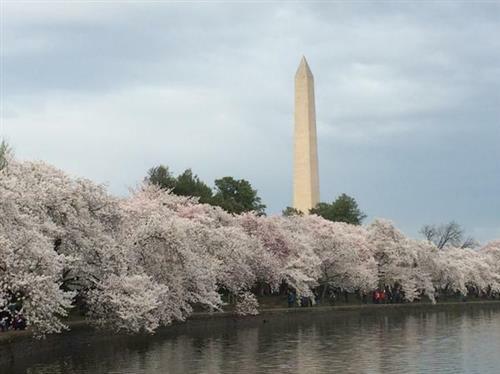 WASHINGTON — Billed as “The Nation’s Greatest Springtime Celebration,” the National Cherry Blossom Festival is underway now through April 12. 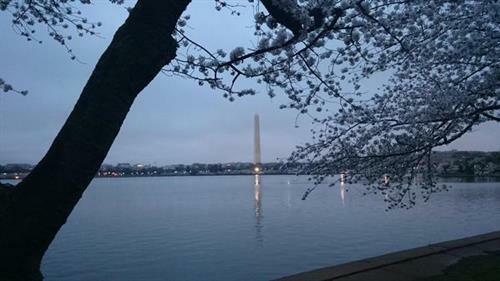 Locals are likely familiar with big festival events that include the parade down Constitution Avenue, a day of music and fireworks on the Southwest Waterfront and a colorful display of kites flying on the Washington Monument grounds. But let’s explore a few of the lesser known festival opportunities on WTOP.com. 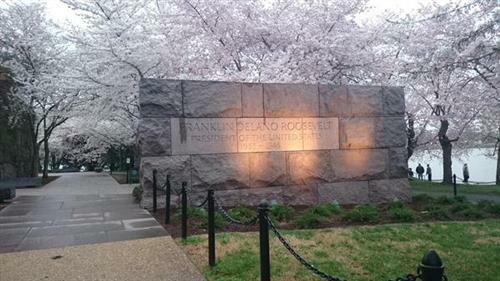 Dulles International Airport and Reagan National Airport are getting into the Cherry Blossom Festival spirit, with pink lighting and cherry blossom-themed promotions. The Metropolitan Washington Airports Authority has bathed the exterior of Dulles’ main terminal in pink lighting, and at National, pink lights have been added to the parking structures, visible through the glass walls of the garages. 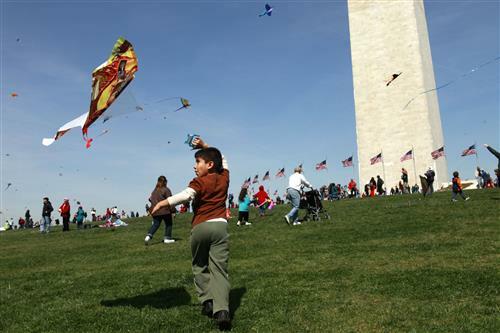 WASHINGTON -- Kites will soar Saturday during the fifth annual Blossom Kite Festival near the Washington Monument. The festival showcases the skills of kite makers and abilities of the kite flyers from 10 a.m. until 4:30 p.m. There are five areas to enjoy: competition and demonstration field, family field, kite club display, activity tents and public field. 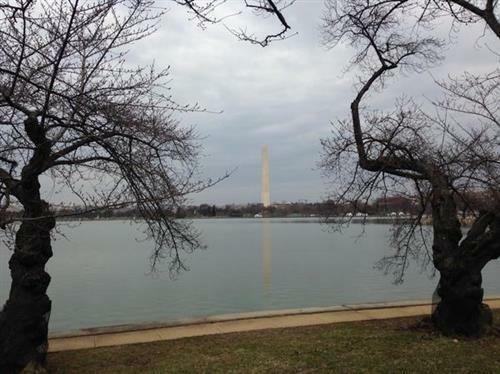 The event is free and takes place at the grounds of the Washington Monument near 17th Street NW and Constitution Avenue. Organizers say drone are prohibited at the event. Kite Ballets and Demonstrations 10:30 – 11 a.m. Adult Kite Makers Competition 11 a.m. – 1 p.m. 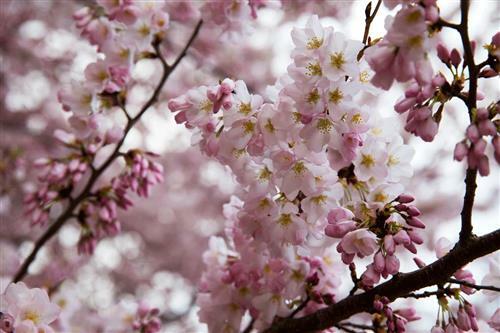 Soar into Spring Demonstrations 1 – 1:30 p.m. Hot Tricks Showdown 1:30 – 2:30 p.m.
International Kite Demonstrations 2:30 – 3 p.m.
Rokkaku Battle 3 – 4 p.m. Puzzle Rokkaku 4 – 4:15 p.m.
Kite Arch & Awards 4:15 – 4:30 p.m. Youth Kite Makers Practice Fly 10:30 – 11 a.m. Youth Kite Makers Awards noon – 12:30 p.m.
Mini Rokkaku Practice 12:30 – 1 p.m.
Mini Rokkaku Challenge (ages 5-9) 1 – 1:30 p.m.
Mini Rokkaku Challenge (ages 10-15) 1:45 – 2 p.m.
Bol Races 2 –3 p.m.
Family Open Fly 3 – 4:30 p.m.
WASHINGTON (AP) — Metro says there will be no weekend track work for the next two weekends as cherry blossom season gets underway. 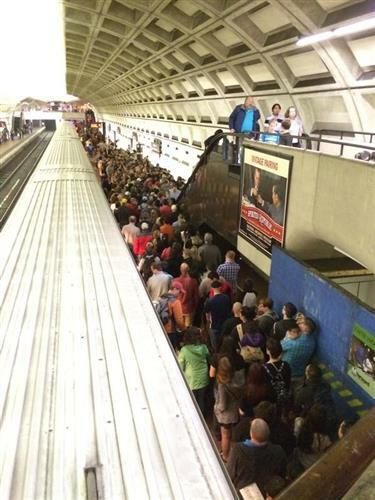 Metro says there will be no track work this weekend and regular rail service on all six lines. The same will be true next weekend. 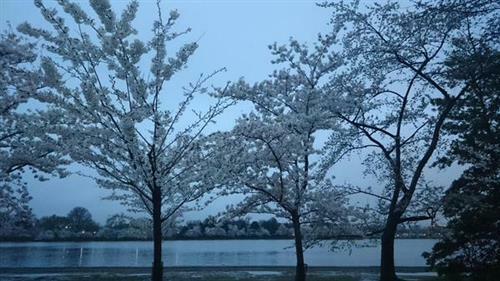 WASHINGTON -- There are many things to see and do at the National Cherry Blossom Festival this weekend, including the Southwest Waterfront Fireworks Festival on Saturday, April 4. The fireworks festival, presented by Procter & Gamble, goes from 1 p.m. until 9 p.m. at the Southwest Waterfront located at 600 Water Street, SW. The event is free and will go on rain or shine. The fireworks start at 8:30 p.m. The U.S. Navy Ceremonial Band and Color Guard: 2:15 – 2:45 p.m.
Wil Gravatt Band, country and honky tonk: 3:30 – 4 p.m.
Blues Alley Youth Orchestra: 5-5:45 p.m. The U.S. Army Band Downrange: 6:30 – 7:15 p.m. The U.S. Army Blues Swamp Romp: 8:15 p.m.
Big Chimney, bluegrass: 1:30 – 2:15 p.m.
Feedel Band, Ethio jazz, funk and soul: 2:45 – 3:30 p.m.
Baltă Mare, Gypsy brass and strings: 4 – 5 p.m.
Pablo Antonia y La Firma, salsa, merengue: 5:30 – 6:30 p.m.
Joe Keyes & The Late Bloomer Band, Conscious funk: 7 – 8:15 p.m.
Amidon Bowen Elementary Youth Choir: 1:30 – 2 p.m. Boys & Girls Club of Greater Washington: 2:30 – 3 p.m.
Shizumi Kodomo Dance Troupe, Japanese dance traditions: 3:30 – 4 p.m.
Cantaré, Latin American Musical traditions: 4:30 – 5 p.m.
American University Takabushi Soran Dance Team, Thai, Filipino and Japanese dances: 5:30 – 5:45 p.m.
For those who plan to attend, organizers strongly encourage the use of public transit to get to the Waterfront area. 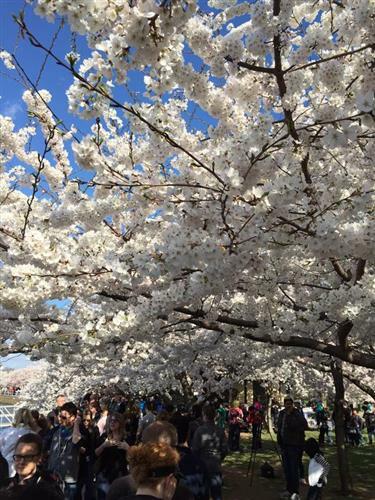 Read more about the event on the Cherry Blossom Festival's website. 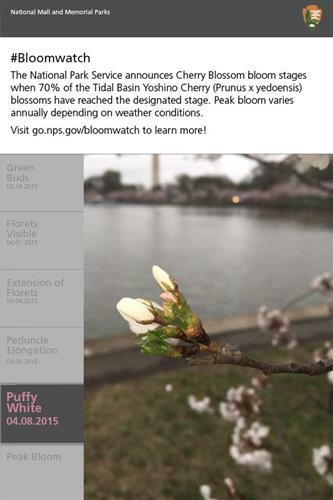 If you love the beauty of the cherry blossoms but hate the traffic around the Tidal Basin, the wonders of technology makes it possible to see what's going on as it's happening. 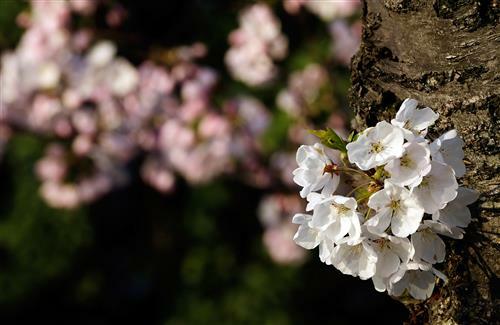 Click here for the Cherry Blossom Cam. 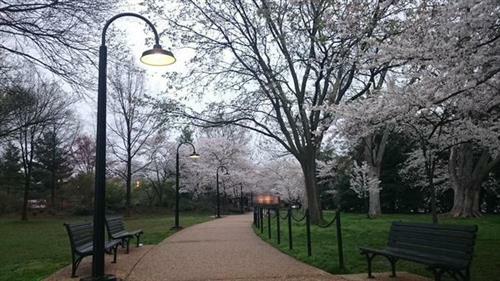 WASHINGTON — Elbow room is tight along Georgetown’s sidewalks during an average weekend. Throw in the masses arriving for the peak bloom of the cherry trees, and there could really be congestion. 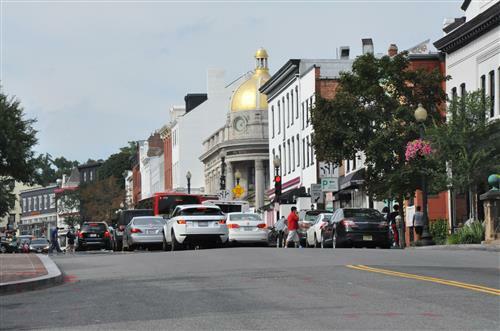 But the Georgetown Business Improvement District (GBID) is turning to an idea tried only three times before: It will widen the sidewalks along M Street from 6:30 p.m. Friday until 5 p.m. Sunday. 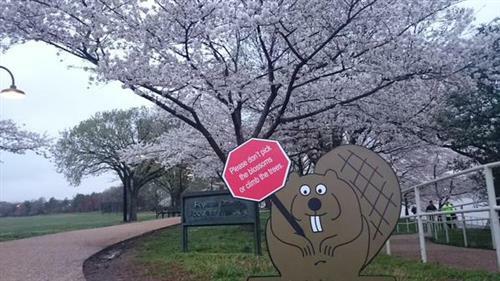 The peak bloom is almost here. 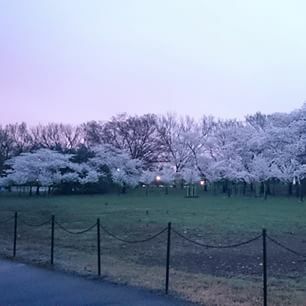 The cherry blossoms have officially moved to the "puffy white" stage. And everyone knows what that means. 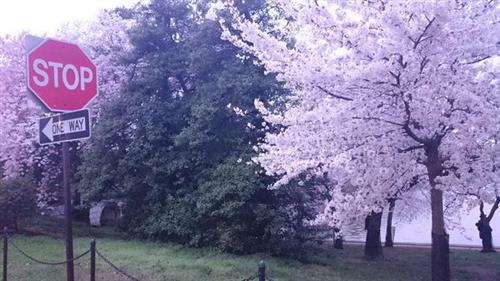 The next stop is full bloom. Get those cameras ready. 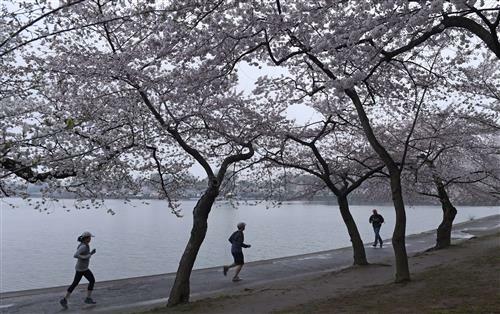 Peak bloom is expected to happen between April 11 and 14. Last year, the peak came on April 10. 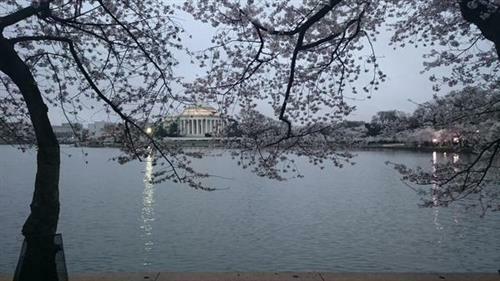 If you're hoping to enjoy the cherry blossoms this weekend in D.C., we've gathered transportation information to help you get there as easily as possible. -Metro: Metrorail and Metrobus are both available, and visitors can easily calculate trip times and directions using the Metro Trip Planner. 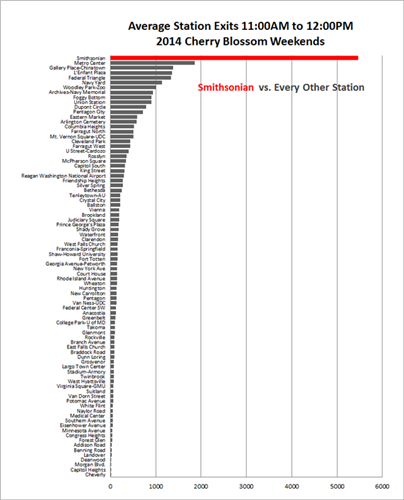 View Metrorail maps and Metrobus maps. -DC Circulator: The DC Circulator is another option offering Downtown access. Click here for bus routes and schedules. -Capital Bikeshare: Capital Bikeshare is another option, with corrals offered on weekends through April 13. 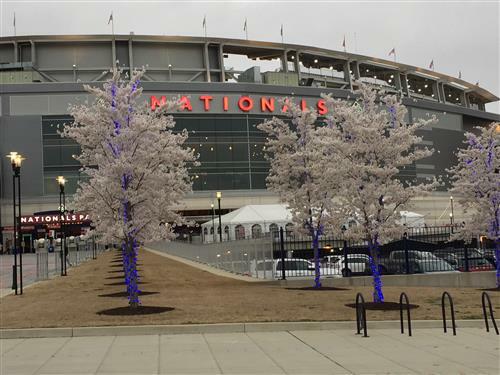 -Driving and Parking: If you'll be arriving by car, visit the National Cherry Blossom Festival's website for directions and parking details, including shuttles. 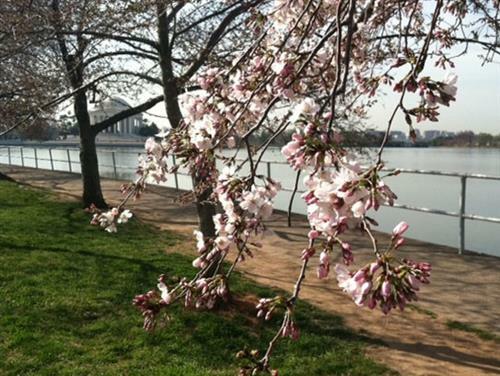 forecast and just in time for the National Cherry Blossom Parade.